My peanut butter obsession means that's usually the jar I reach for when there's cookie baking to be done. And since it's been raining non stop for so long that I've actually lost track, there has definitely been cookie baking. But I decided it was time to show the almond butter some love as well. While I might still prefer the peanut butter for eating straight out of the jar with a big spoon (What? Is that weird? Please tell me that's not weird! 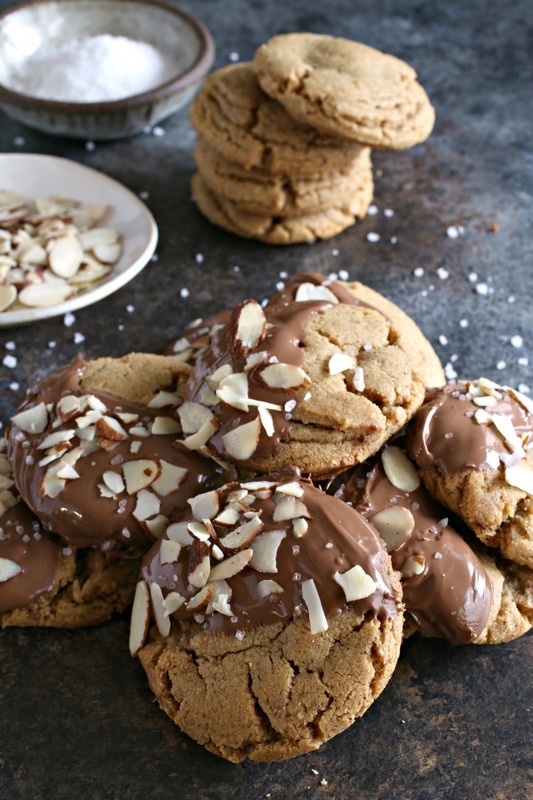 ), the almond butter is actually fabulous for baking. 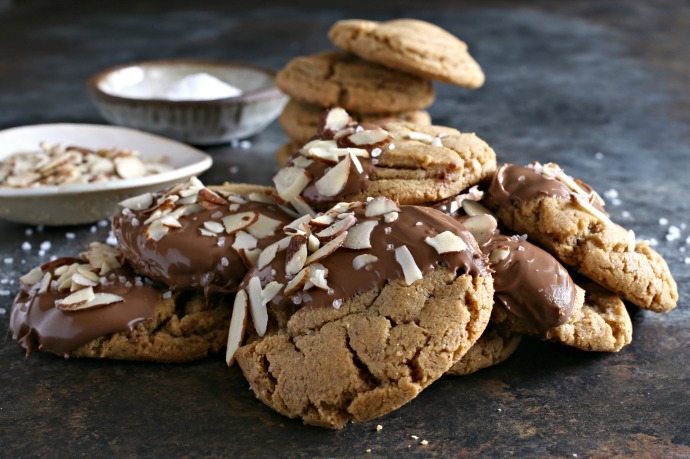 I've always loved almond flavored cookies, whether they get their flavor from almond flour or almond extract. But using almond butter packs the biggest almond flavor punch of all. They're great just as they are or you could certainly add the cup of chocolate chips right into the dough. But I enjoyed the slightly crispier texture the cookies had without the chips. Instead I just melted the chocolate, dipped in half the cookie and gave it a good sprinkling of sea salt and slivered almonds. I have no idea what the shelf life of these cookies might be since they were devoured pretty much instantly. Enjoy! Cream together the brown sugar, granulated sugar and butter using a stand or hand mixer. Beat in the egg, vanilla and almond butter. Whisk together the flour, baking soda and salt and beat into the wet mixture. Using a 1 oz. cookie scoop, scoop balls of dough onto a baking sheet lined with parchment paper. Keep the balls about 2" apart and press down on each ball very slightly. Bake for 10 minutes and allow to cool thoroughly. The cookies will flatten out as they cool. Add the chocolate chips to a bowl and melt in the microwave for a few seconds. 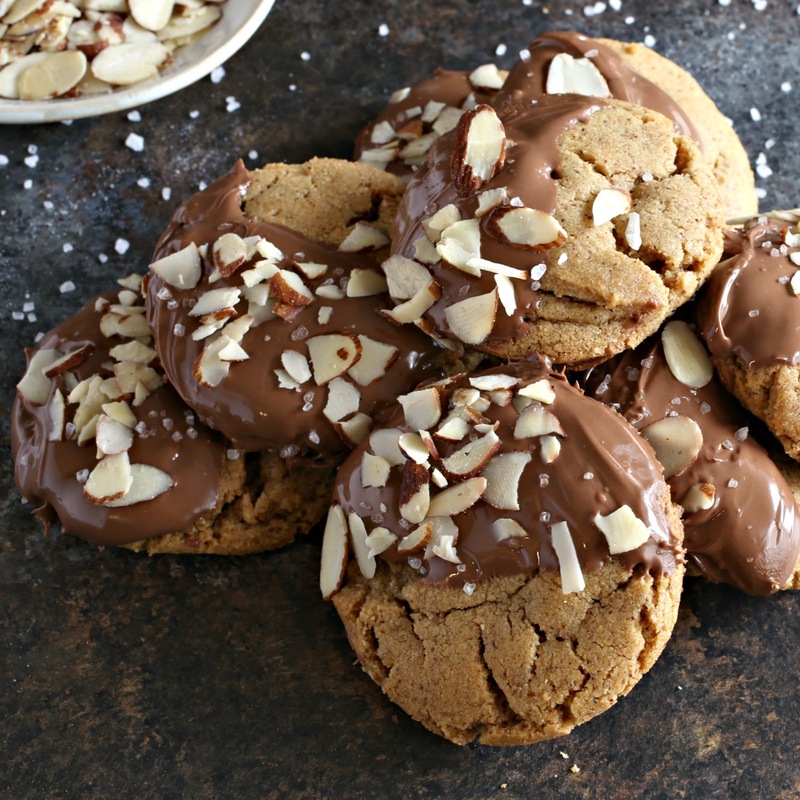 Dip each cookie half way into the melted chocolate and sprinkle with the slivered almonds and sea salt. 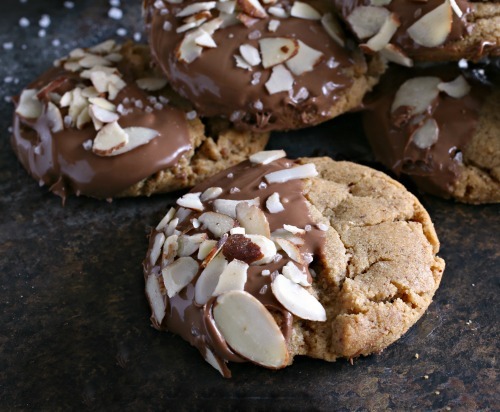 I totally agree-almond butter is extra good for baking! 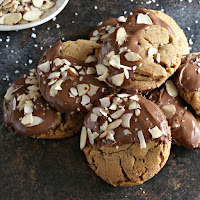 Especially in cookies as amazing as these and when covered with chocolate, aghhhh they look amazing!